This is the third time I've made this cake. The first was for a birthday, the second for a dinner party and the third was also for a birthday which happens to be today. 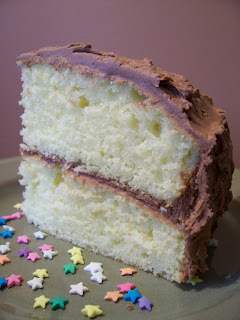 It is a classic layer cake - light, fluffy and golden with chocolate frosting. 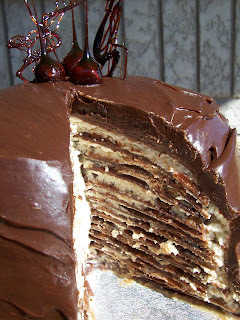 The cake comes from Chocolate & Vanilla by Gale Gand and I really love it. The recipe seems a little finicky but you most definitely do not need a fancy mixer to whip it up. Just note that the frosting just covers the cake - you won't have any leftover. Add some ice cream and you have one of the best desserts ever. So if you want to do something special for someone you know bake them a cake and if your birthday is today, Happy Birthday! 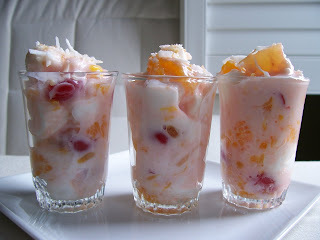 One of the desserts I remember eating when I was young was Ambrosia. It is a cool melange of chewy marshmallows and juicy fruit all held together by a white cream, most likely Cool Whip. I loved how the marshmallows would soften up and I have never been known to refuse a maraschino cherry. I wanted to recreate it so I went looking for a recipe. Well, the Internet was very helpful, giving me multitudes of recipes. 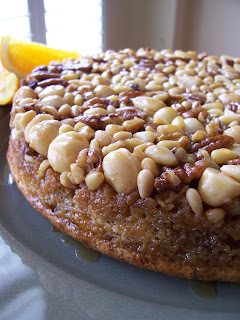 Some with nuts, some using sour cream or fruit cocktail. No two were alike except in their use of marshmallows so I took components from them and made my own. After deciding on a mixture of pineapple, mandarin, cherries, coconut and marshmallows I got to work. Using sour cream to bind it all didn't appeal to me so I used vanilla yogurt and the result was like going down memory lane. The first bite was Ambrosia! 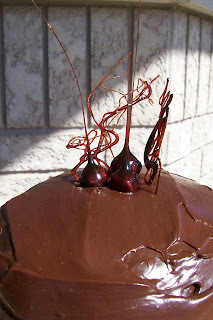 It was so easy to prepare and everyone enjoyed it, though I did hear one grumble about the cherries. 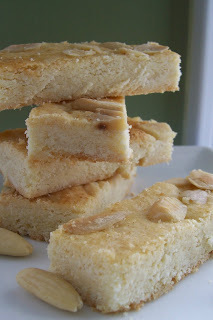 The recipe can be easily doubled or tripled and makes a great no bake summer dessert. Of course, you can change around the ingredients as you like - it is very forgiving. Give it a try! I have never really explored baking with peanut butter much beyond making cookies. Many people I know are fond of the peanut butter and chocolate combination and I enjoy it somewhat. Every now and then, I will indulge in a Reese's Peanut Butter Cup but it is never my first choice. 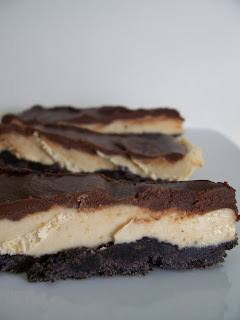 I have had my eye on this no-bake Frozen Peanut Butter Pie for a while. I wanted to try it out because I don't have much luck with frozen desserts other than homemade popsicles. Everything comes out really hard and difficult to cut. I think this is just a mental block since I like to bake - of course everything is hard, its frozen! The second reason I wanted to try it was to see how it would turn out using natural peanut butter as opposed to regular Skippy or Kraft. The actual pie assembly was a cinch. Each component was made and then frozen until it was finished. One thing I would do differently is add one more square of chocolate to the chocolate glaze for better pie coverage. Overall, my family liked the pie. It wasn't too sweet and I didn't add extra sugar to compensate for the natural peanut butter (which was very smooth) and it was still tasty. Just let it warm up at room temperature before cutting to soften it up. Impatient cutting leads to broken crust!